I think it is fair to say that the British series the naval medal began with the defeat of the Spanish Armada in 1588. Although it was Drake, Howard and Hawkins with their intrepid sea captains who doggedly attacked and weakened the great Spanish Armada, led by the Duke of Medina-Sidonia, it was a series of fierce gales that in the end dispersed the enemy fleet. 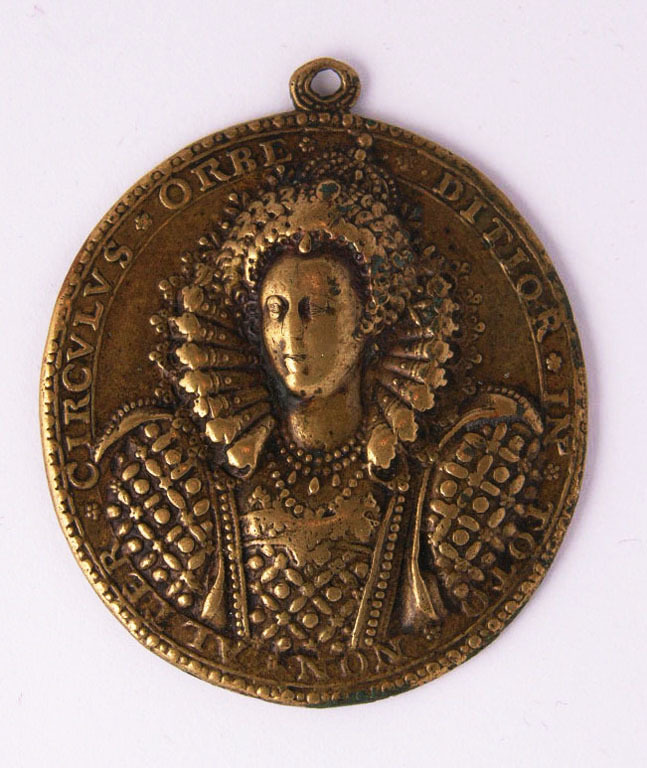 The Dangers Averted medal of 1589 which is attributed to Nicolas Hilliard (1537-1619), and found in gold, silver and copper was a cast and chased medal and has to be England’s first naval award medal, although the distribution was not exclusive to men of the sea. Previous to the Armada, Queen Elizabeth showed her favour to men who had provided an important service with the gift of a miniature portrait of herself or a valuable jewel. This practice was both costly and always took time for the miniature to be painted or the jewel to be manufactured. The introduction of the cast and chased or struck medal substantially reduced cost and speeded up availability of the gift. I think that it is with this promise to all who were before her, that she decided that if victory for her prevailed, that she would indeed reward those, whatever rank they may be, who brought that victory to being. That the medal is ascribed to Hilliard is most fitting as he was Elizabeth’s principal miniaturist. The reverse features the bay tree which was believed to ward off lighting and disease. The style of the Dangers Averted medal is as distinctively English as noted by Roy Strong in his two works regarding the English icon. That the medal is found in gold, silver and bronze makes me think that Elizabeth established the standard of distribution which appears to reflect the station of the recipient and was followed for the next 200 years or more. This bronze example (pictured) has undoubtedly been worn and served as a touch piece for many years. The medal was almost certainly awarded to a brave petty officer or seaman. It is also important to note that with Elizabeth, the whole nature of England changed in that she would not involve her realm in Continental wars but would look at her domain as the sea and that it would be from the sea that England would gain her wealth through trade but also her protection with her sailors and fleet. And so it was that with Elizabeth I the practice of awarding naval medals commenced, but it wasn’t always maintained by her successors. James I didn’t really distribute naval medals, however Charles I did and then Cromwell during the Commonwealth and during the reign of Charles II; fine naval medals were created, particularly to recognise achievement during the four great Dutch Wars. During this time, the Dutch too created astonishing naval medals to record the victories of Trump and de Ruyter. William and Mary also produced some very fine naval medals, but then with the reign of Queen Anne and the early Georges, the tradition largely lapsed. It was King George III who brought it back and in a fashion which not only meant medals were awarded by the King, but inspired private individuals, who took it upon themselves to also recognise achievements at sea by awarding naval medals. Following Admiral Earl Howe’s defeat of the French fleet on the Glorious 1st of June, 1794 when Howe’s flagship, Queen Charlotte, arrived in Portsmouth, the King came on board and presented Howe with a long gold chain as a mark of achievement. The King then ordered that large gold medals, that would be suspended by a blue and white ribbon from the neck, be granted to victorious flag officers. 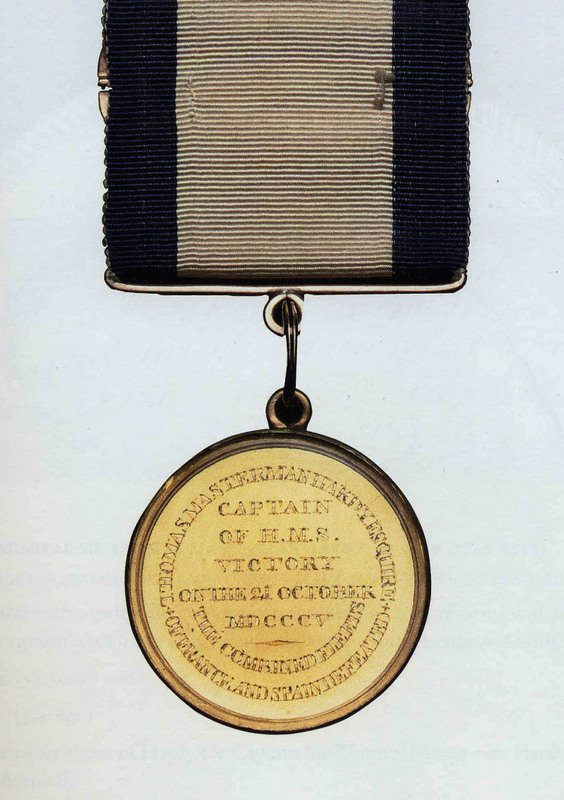 A small gold medal, also suspended from a blue and white ribbon and worn at the uniform buttonhole, was awarded to victorious captains. Although this practice was greatly admired by the recipient officers, it was also fraught with problems, particularly as Howe nominated only certain of his captains of his fleet to receive the naval small gold medal. Those he didn’t select were left with the taint of ‘lack of zeal.’Another facet for discontent was the view to save money by being restrictive in terms of who qualified for a naval gold medal. An example being that Captain Hardy of the brig Mutine at the Nile, received no medal because Mutine wasn’t a ship of the line. Lieutenant Cuthbert of Majestic, who fought the ship right through the night at the Nile following the death of his captain, George Westcott in the first 15 minutes of the action, and probably accounted for more enemy ships than any other at the Nile, didn’t receive the medal because Cuthbert wasn’t a captain. Captain Hardy’s Trafalgar naval small gold was auctioned by Christie’s in 2005 and made over £260,000. The situation was also made difficult because the government was involved with the decision as to who would receive a medal. Nelson and his captains received no medal for their victory at Copenhagen in 1801 and Gambier also received no medal for himself or his captains when Copenhagen was again attacked in 1807. As Nelson mentioned, ‘our brothers the Danes’, reflected accurately on the national sentiment. The Danish actions were necessary, but not to be celebrated. Although several English medallists during the period 1793 – 1815 produced naval medals as commercial ventures to sell to both the collecting public and to officers and men from returning victorious fleets, there are two very important private ventures from the period which weren’t based on commercial gain, but just as a mark of respect to Britain’s brave seamen. Alexander Davison was a very important personal friend of Nelson’s and was the prize agent for Nelson’s fleet at the victory at the Nile, 1 August 1798. Such was Nelson’s success, and one that many today consider this his finest victory even eclipsing Trafalgar, that Davison asked Matthew Boulton to produce a medal in gold to go to Nelson and his captains, in silver to his senior ship’s officers, bronze gilt to petty officers and bronze for the men. A fine bronze gilt Davison Nile medal that has been engraved, cased and glazed will bring between £3,000 and £5,000 in auction. Nelson was thrilled by this gesture and kept a supply of bronze medals with him which he presented as a token of regard during his subsequent travels. Some of the men of the Nile, having seen how good the gilt examples looked, had their medals gilded and named and these medals are now highly sought after by collectors. Davison used the Crown’s scheme for distribution of his medal, so the captain and men of the brig Mutine didn’t receive the medal. One remembers that when the Davison gold medals for captains arrived with Nelson to distribute, Hardy was with Nelson and Nelson gave to Hardy the medal intended for Captain Westcott of Majestic ‘because he won’t be needing it now!’ said Nelson of the dead Westcott. The gold Westcott / Hardy medal was auctioned by Christie’s in 2005 and made over £80,000. Matthew Boulton was himself struck by the generosity of Davison and with the victory of Nelson’s fleet at Trafalgar, had a medal in tin struck at his own expense and distributed to the men before the mast. Boulton’s reckoning was that the officers would receive sufficient rewards; it was the men who needed special attention. His gift wasn’t always received well though as the men thought their tin medals inferior to the bronze medals of the Nile, and some threw them overboard. Having said that, many men fully appreciated the importance of the gift and had their medals engraved, cased and glazed and when found today, fetch between £3,000 to £5,000. There is also a large tin medal which is believed to have been presented by Davison to just the men of Victory. Nothing certain is known, but today it is generally attributed to Davison and the medal fetches between £2,000 and £3,000 in auction. Although both the Davison Nile and Boulton Trafalgar medals are deemed ‘unofficial’ awards, they both gained the approval from the King and the Admiralty for their distribution to the men of the victorious fleets. Nelson’s effigy in Westminster Abbey shows the admiral wearing a bronze gilt Davison Nile medal. 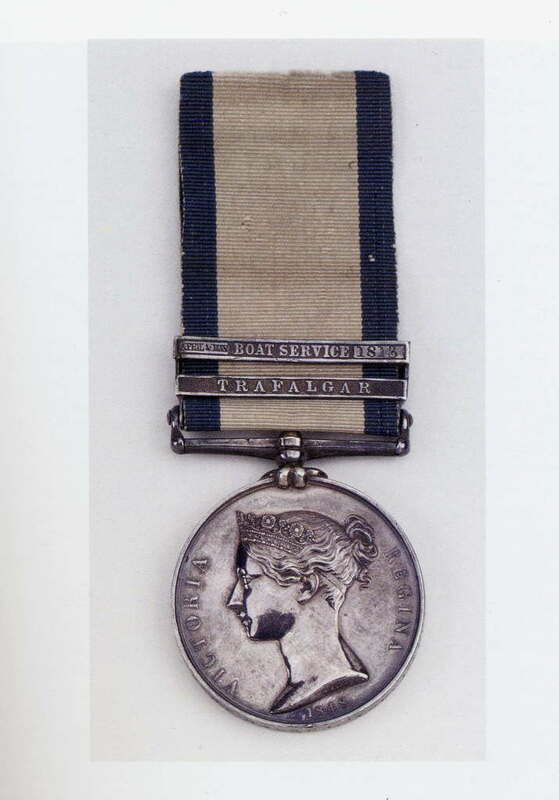 There followed in 1848 the first Naval General Service Medal which was again fraught with difficulties. The general feeling was that the Crown should recognise the efforts made by the officers and men who fought at sea during the two great French wars. The same concern went to the Army. As a result the NGS and MGS were awarded to men still alive in 1848, who could prove that they took part in a naval or military victory. If one considers that nearly 20,000 men fought at Trafalgar and only 1,250 NGS medals were awarded with the Trafalgar clasp, one can imagine the discontent felt by many families. Further, for an action to be recognised, an officer had to have been promoted because of the action, which left many fine actions without recognition. Although Nelson’s victory at Copenhagen in 1801 was recognised with a clasp, Gambier’s in 1807 wasn’t. And worst of all – Admiral Sir George Cockburn, who had been First Sea Lord in the 1840s; his capture of Washington was not recognised, and Cockburn was not at all pleased because this was the capture of the only enemy capital during the long wars, but again politics meant that one shouldn’t celebrate such a victory over the Americans. Today, an NGS with Trafalgar clasp will easily make £5,000 in auction, and medals with rare clasps may fetch four or five times that amount. One should also mention the establishment of the Lloyd’s Patriotic Fund in 1803 which awarded swords and vases of honour to such men as they deemed worthy. Perhaps more important was the care and support of the wounded and the provision of annuities to the dependants of seamen killed during the Napoleonic War. The fund still exists and continues to support men and women casualties while serving with Her Majesty’s Forces. Totally off topic but every time I see anything about the Great Armada I think of the old legend that the witch’s of England all got together and conjured up the storm. It makes for interesting reading.